After buying a gold bar (1kg, 10oz) or silver bar (100oz) we offer you an industry first by giving you the opportunity to reduce our private custodial storage fees. You achieve this discount if you perform a personal visit to the vault in order to inspect and audit your physical precious metals Holding. This discount applies to the fees for both private investor and corporate entity Central Holdings. So Why the Discount for Personally Visiting Your Holdings? Unfortunately there are many bad actors out there that are all too happy to take your money and then not actually buy & vault allocated physical bullion in return. In 2007 Morgan Stanley settled a class-action lawsuit against them as they had been charging their clients storage and insurance fees for physical bullion that they said they had bought, but as it turns out – the bullion never really existed. For a better understanding about the case, take a look at Ted Butler's article. So when you are buying a gold bar to be privately vaulted on a safe custody basis, how can GoldVu provide you with Peace of Mind that the physical bullion is really there and allocated? "See...it's all there - Trust us!" The above is the primary reason that we want you to personally visit the vaults to inspect your Central Holding, and in return we will give you a discount off our custodial storage fees. No-one else in the entire global precious metals industry offers such an incentive! ...makes you wonder why not. Furthermore, you'll have fun finding out what it's like to visit a high security vault. 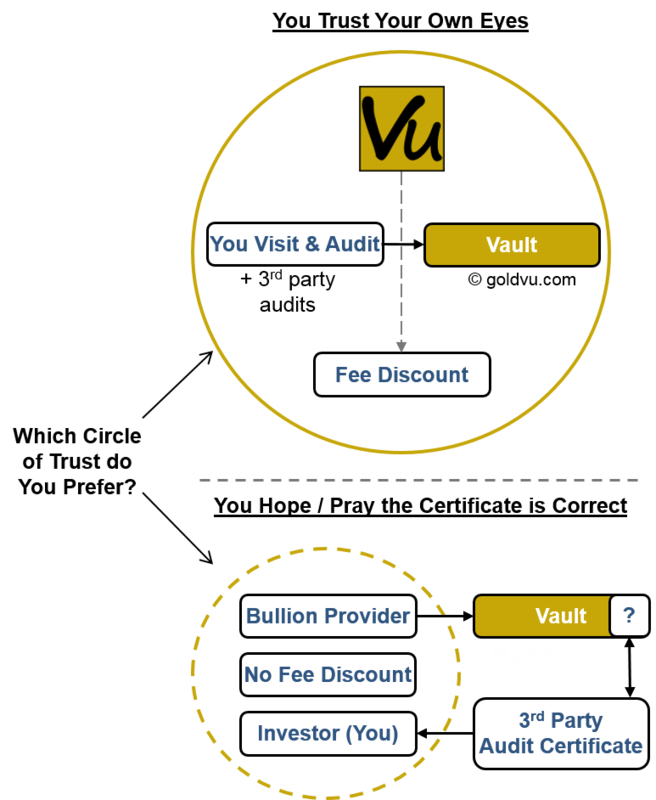 The Allocated Bullion Exchange's global network of vaults are all owned by specialised private vault providers. These vault providers are amongst the best and most highly regarded in the industry. So after buying a gold bar you want to see it, touch it and get a discount on your custodial storage fee - how do you go about doing it? We will then arrange and confirm it all with the vault provider. Once confirmed, you can then book your travel arrangements and enjoy the experience of visiting a high security vault. Please note that visiting facilities don't exist at the Australian Armaguard vaults. Remember your Holding needs to be physically segregated before it's eligible for personal inspection and audit - as how are either of us to know which exact bars are yours? When buying a gold bar - and silver & platinum – you should always have confidence that it’s really there. We want you to have that confidence about us and our custodial storage services.